Kilgore’s Medical Pharmacy can fit you for your diabetic shoes. Diabetic shoes offer numerous benefits and look great too! Regular shoes are often designed for style and can create pressure points on a person’s foot. Calluses can form more regularly and more quickly on a diabetic patient’s foot in areas of pressure. If not treated correctly, these calluses can lead to even more foot issues. 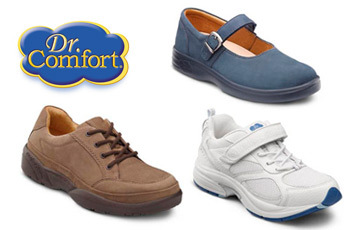 Diabetic shoes work to prevent foot issues in diabetics by greatly reducing pressure points. Shoes are designed to have a deeper toe box and fewer seams. Kilgore’s also offers moldable insoles that we heat up and mold to the bottom of the patient’s foot. Kilgore’s has a variety of styles to choose from: tennis shoes, lace up shoes, Velcro shoes, sandals, and boots. If you are approved for shoes through Medicare and have met your Medicare Part B deductible, Medicare will pay for 80% of the cost of the shoes. Medicare will also pay for 80% of the cost of up to 3 pairs of moldable insoles when approved. Kilgore’s carries Dr. Comfort, Apex, Justin Blair and Diafoot brand diabetic shoes. YOUR INSURANCES MAY PAY 100% OF THE COST OF DIABETIC SHOES. Kilgore’s is a full-service diabetic supply pharmacy. This means we will do everything we can to make managing your diabetes easier. Whether you need diabetic meters, glucose strips, diabetic shoes or insulin, you can find it here. It also means we will take the time to show you how to use your meter and answer any questions you might have. We can bill covered items to Medicare and Medicaid. We can even order products we don’t stock. Just ask! Interested in diabetic shoes, give us a call at 573-442-0194 and set up an appointment with Andrea today!